AS part of the extensive programme of events leading up to the inaugural National Famine Commemoration Day in Skibbereen on Sunday, May 17, Skibbereen Theatre Society is presenting two productions – a play and a pageant – which deal with various aspects of the Great Famine of the 1840s. The most ambitious production, which has been in rehearsal for over two months, under the direction of Fachtna O’Driscoll and Catherine Field, is Nenagh schoolteacher Jim Minogue’s award-winning play Flight to Grosse Ile about an Irish family forced to emigrate to Canada at the height of the Great Famine. There are 43 characters, with some of the cast of 30 – including actors, musicians, singers and dancers – doubling up in various parts. Trying to rehearse and direct that many people and then pull the whole show together with its extensive costuming, complex lighting plot and sound effects is potentially a logistical nightmare, but it seems to be coming together well as opening night approaches on Wednesday next, May 13, at Skibbereen Town Hall, with that night’s proceeds going to Third World charities who are still tackling famine and injustice in many poor countries today, especially in Africa. There will be two further performances of Flight to Grosse Ile – which was a particularly apt choice of play by Skibbereen Theatre Society, because there is a commemoration ceremony in Grosse Ile, an island close to Quebec, this Sunday, 10th – to get the week of events leading up to the first National Famine Commemoration Day here under way. These shows will take place at the Town Hall on Saturday and Sunday, May 16 and 17, with curtain at 8pm nightly. Before the Saturday night show, there will be a brief illustrated talk about Grosse Ile Quarantine Station and its significance during the Irish Famine period by Professor Mark McGowan of Toronto University in Canada. Tickets for the three performances of Flight to Grosse Ile are available in advance from Thornhill Electrical, Skibbereen, tel. 028-22316. The play, set in 1847, focuses on the separate journeys to Canada of a young girl, Catherine Kennedy, and her boyfriend, Eoin Mac Aogáin, and tells their tragic love story, with plenty of music, song and dance, as they flee the Famine here, optimistically looking forward to a better life abroad. Skibbereen Theatre Society’s other production during the events leading up to National Famine Commemoration Day is their acclaimed pageant The Boldest Fenian Man, which was devised and is directed and narrated by Con Downing of The Southern Star, who is also chairman of the local drama group. This 25-minute piece was commissioned by Skibbereen Comhaltas for the opening of the Munster Fleadh Cheoil in 2003 and has been performed a number of times each year since at various arts, heritage, historical and festival events, as well as for secondary school students. With Frank McCarthy reprising his role as Jeremiah O’Donovan Rossa, the pageant charts how his singleminded radicalism stemmed from the horrors and degradations he witnessed as a young boy during the famine years in his native West Cork and led to the founding of the Phoenix Society in 1856 and, subsequently, provided inspiration for the leaders of the 1916 Easter rising. Brendan McCarthy is the balladeer in the production and Frank, Con and Brendan are also playing parts in Flight to Grosse Ile. 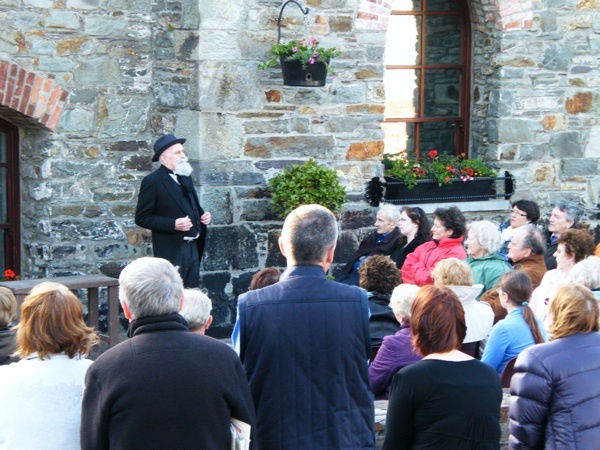 There is no admission charge to The Boldest Fenian Man, which will be performed in the courtyard of Skibbereen Heritage Centre (weather permitting; otherwise indoors) at 7pm on both Monday 11th and Thursday, May 14.